i'm fairly certain that out there somewhere is my fairy godmother, or rather my fgm. so, just in case she is out there listening, or reading, whatever be the case, i just wanted to let her know that currently at the top of my wish list is THIS new stroller. & just because i like to help her out, & because i know she wants to hook me up with this fabulous new stroller, if she acts NOW, when she purchases me the stroller, she'll get the doubles kit for FREE! at a savings of $100, that's quite the deal! plus, it gets even better... because shipping is just a flat-rate of $7.99 on all orders! cha-ching! 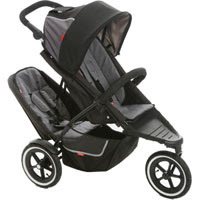 so seriously, fgm, or anyone else who feels so inclined to, can send me THIS here stroller. i won't mind a bit! when left to their own devices, boys can certainly come up with couple of ways to have fun... helping themselves to birthday cake, lending a helping hand in the kitchen & even re-redecorating. i guess it's true... boys will be boys. what else can they do in a day? we headed up LA to another concert this week. this time around we went to see one of jeffy's favorite groups, bloc party. luckily, on this adventure, there were no incidents to report, unless you call being the oldest one there an "incident". seriously, nothing makes you feel old faster, than looking around & realizing that you are surrounded by kids. nevertheless, i still loved rocking out to my favorite bloc party songs: helicopter, like eating glass, so here we are & flux. in other news, i recently received a little something in the mail. 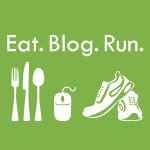 considering the timing, i have to wonder, do you think they read my blog? holey moley... just spotted is having a giveaway! & we've pulled out all the stops! i promise, this is one giveaway you don't want to miss! that's right, we are giving away some of my favorite things... & you know how much i love anything from TOO FACED! it's such a great prize, i really kinda wanted to keep it for myself. but seeing how that isn't possible, maybe one of you lucky people will win! good luck, may the force be with you, & be sure to read up on all of the ways to get some extra entries! check out the details regarding the giveaway HERE. but, hurry, the contest ends tuesday, august 5th. as they say... why be pretty when you can be gorgeous? heat oven to 350 degrees. combine the cake mix, pudding, eggs oil & water. beat with a mixer until the mixture is smooth. pour cake into a greased bundt cake (or a 9x13 glass pan works well too). Bake for approximately 35 minutes, or until an inserted toothpick comes out clean. while the cake is cooking combine the powdered sugar and thawed frozen lemonade. beat with a mixer until smooth. once the cake is done, pierce the bottom of the cake (if using a bundt pan), or the top of the cake (if using a glass pan), with a fork, wooden skewer or dried spaghetti noodle (which is my preferred method). 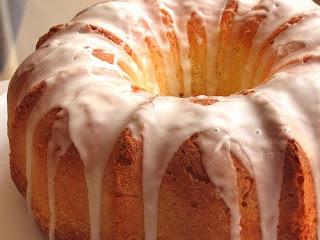 slowly spread half (if using a bundt pan, if your are using a pyrex pan spread the entire mixture) of the lemonade mixture over the cake, allowing it to soak in, & return the cake to the oven for an additional 5 minutes. when the cake is finished baking, if using a bundt pan, allow it to cool for about 5 minutes before flipping it out. once you flip it, poke additional holes in the top of the cake & slowly pour the additional lemonade mixture on top of the cake, creating a glaze. after the hustle & bustle of the big city we were ready for blue skies, sandy beaches, the sun on our faces and a little r&r. digging on the beach, developing tan lines, going to the spa,eating delicious food, & we may have seen a junkanoo or two. it truly was heaven on earth! i think i'm ready to go back. just one year ago, we were doing a bit of traveling, when we stopped in one of my most favorite-est cities (& yes, i realize that favorite-est is not a real word, but how else do you describe something you LOVE?). anyway, we just happened to be there just in time to see the grand finale of this fabulous race. seeing the boys cross the finish line once again today, makes me wish i was there. i look forward, with much excitement & glee, to my weekly shopping trip to target. on my recent trip i spotted us map puzzles, learn your colors flip books, mini globes, & a whole slew of other "slightly" educational toys & books in the dollar section. i also picked up the most recent addition to my wardrobe... a ruffly gray shirt. gosh! i love that place. shopping at urban outfitters, while in new york, i came across some fabulous accessories, that i just had to have. 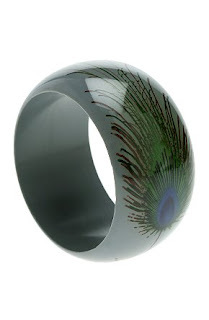 THIS eye-catching peacock bangle hasn't left my wrist yet. 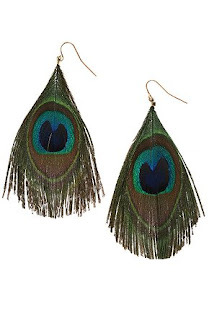 and i actually didn't get THESE earrings. instead i came home with a bright & beautiful peacock feather necklace. but, i guess they aren't selling it online, so THESE fancy baubles will have to do. i heart the big apple. gavin loved the view from our room, we had a hard time keeping him away from the windows, but who could blame him? a completely unobstructed view of central park? breathtaking! 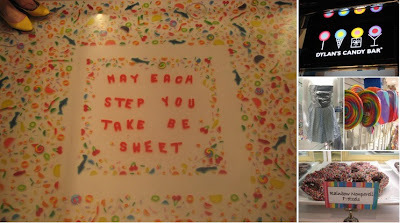 no trip to new york is complete without a stop at dylan's candy bar. you can't beat three entire floors of candy. everything & anything you could possibly dream of... lollipops & jelly beans, nostalgia candy, but unfortunately for me - no big bins filled with vanilla tootsie rolls (my personal favorite). and in the front window, i spied the entire collection from project runway's hershey challenge. of course we found some time to do a little (okay maybe a lot) of shopping, explore central park, catch a musical, & eat lots and lots of new york pizza. but we also managed to pack in a yankee game. of course we visited the brightest lights in the big city, checked out the huge ferris wheel inside toy 'r us, and ate hot dogs & roasted peanuts from the street vendors. and as the story books go, our trip to new york ended happily ever after with a midnight serving of serendipity 3's frrrozen hot chocolate. as you can see... we definitely played hard. it's no secret that i have an addiction. it started slowly & innocently enough... just a little here, and maybe some there. i rarely did it home & i tried to not let it take over my life. for a while i was in complete and total denial. i just did not want to admit i had a problem, it was much easier to justify it. over time that denial turned to anger. anger at the people around me for letting it get so far, anger at me, anger at my suppliers. it wasn't long before i was bargaining for it. i would tell myself... just on thursdays, i would do it. or, only if i was having a crappy day. that lead to a bit of depression... why couldn't i just have it? seriously, what was the big deal? and finally, i think, hopefully i've made it to acceptance. i mean, here i am admitting that i have a problem - that's gotta count for something, right? so i've realized & accepted the fact that i have a problem. i guess the next step in this painful journey of self-discovery is doing something about it. so sunday night i made a drastic decision to go cold turkey. i guess i could have cut my drugs of choice out of life at a slow and steady pace. but really & truly, deep down inside i just knew that wouldn't work - i'm an all or nothing kinda girl. & i'm proud to report that i've made it this far. i'm not going to say it has been easy, & believe i've been tempted a time or two (it's hard to say no, when everyone else is doing it). but, i've stayed strong. that's right! cherry coke, dr. pepper & regular coke... you aren't going to get the best of me! i'm going to win this battle. wish me luck. with nothing but a lot of empty yesterdays. but I'd like to make today worth remembering. the lighting is dim, almost non-existent, except of course for the flickering black lights, which resemble a low-budget light show. the music is pumping. i look around & everyone, including me, is moving & swaying to the beat. i feel a bead of sweat roll down my forehead & quickly i reach up to wipe it away. he peers around the corner. almost immediately i feel him watching me. i try to play dumb & ignore him, but he starts to move towards me. he weaves in & around the other people, swiftly, almost athletically. all the while, i feel his eyes on me. as he makes his way across the room a zillion thoughts enter my mind. "me? he can't be heading towards me. i must be calm... play it cool." when he finally reaches my side, he says nothing. he simply head nods towards the door, while raising his eyebrows just a bit. mesmerized, i too say nothing. and almost trance-like i follow him. once again he weaves in & around the other people, this time however, i am following. i notice that people have started to notice us. i feel their eyes on us & hear the whisperings. although, at this point i'm too self-involved to really pay too much attention... i'm too busy thinking to myself, over & over "he came for me?!" after what seems an eternity, we finally reach a quiet place, somewhere where "we can talk". immediately, without even thinking, i ask the question on my mind. "what did they do, & which one was it?" he simply shakes his head & said i'd have to talk to the child-care coordinator about that. i reach the children's play area & the first thing i notice is that there are four children, two of which are mine. in the corner of the room stood the "child-care coordinator". as soon as i walk in, she blurts out "they have to leave." whoa?! what?! they have to leave? what in the world could have prompted this? i'm the first to admit that my children aren't angels. but the definitely aren't malicious trouble makers.... it's not like they go around biting, pushing & otherwise bullying kids for no reason at all. pointing at gavin she says "he dumped the crayons", and then pointing at owen she says "& he pushed him back" pointing to another boy (who was twice o's size & probably age as well). shocked & very embarrassed, i didn't think to actually ask any questions. i simply gathered up my boys & left the facility, with my head hanging very, very low. i'd always worried about it, even had nightmares about it, but i never thought i would have been banned from the child-care at my gym! & even though i think the child-care coordinator may have over-reacted (come on! kicking us out because a 3 year old dumped some crayons, & because a 1 and 1/2 year pushed back at a 4 year old), i'm still too embarrassed to say anything about it. instead of being brave, brushing it off & going back the next day. i decided to cower. it took nearly a week for me to get up the nerve to go back. 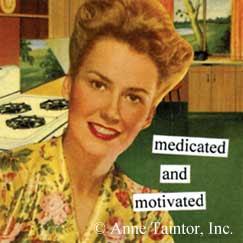 however, now, i leave the house early each morning, hoping to get in a workout before my family even wakes up. still embarrassed, i try to sneak in & out of the gym before the child-care coordinator even arrives. so i'll admit it, loud & proud... i am a total wimp! maybe the next time i go to the gym, i can work on strengthening my backbone! a funny thing happened on the way to coldplay. we were stranded on some random freeway in the middle of LA. unfortunately, AAA was one of the expenses we had cut recently, in an effort to save money. 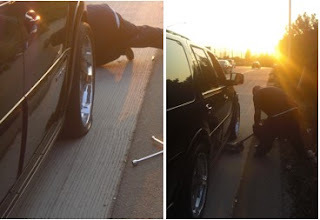 (and just so you don't think we are total idiots... i can change a tire. i just didn't realize the tire iron in the car didn't fit the lug nuts.) luckily, my mom is nice & hooked us up. she made the call to AAA. & fortunately, we still made in plenty of time to watch, listen & rock out to them. this time we got to visit a quaint little part of town, people refer to as east LA. we found a nearby tire shop where they quickly asked for the spare. all we could do was, head nod to where it was, already on the car (i hadn't gotten around to getting a new tire quite yet). luckily they could fix the tire. so what's first on my to-do list? get new tires. we're heading to the beach for a few days... be back soon! this would be a perfect edition to any fourth of july bbq. 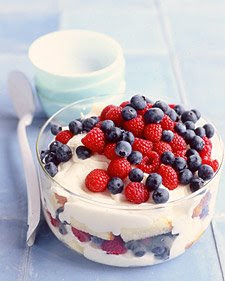 get the recipe for martha's red, white & blueberry trifle HERE. & if you're looking for last minute decorations check out her ideas HERE. 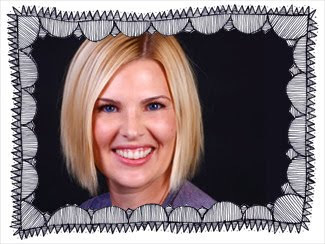 she's got instructions for everything from garland, to paper lanterns, to napkin rings & more. 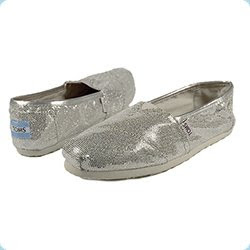 i LOVE the silver glitter toms, heck, i love anything that has the word glitter in it's name! i may just have to get a pair. they would definitely put some spiff! in every & any outfit. plus, for every pair of toms shoes purchase, toms will give a pair of shoes to a child in need... so, my purchase would really just be more of a good deed in disguise. i think i'm sold. i'll be spending a couple of days visiting some friends over at tangled & true... be sure to stop by & say hello, it's always nice to see a few friendly faces! This has been such an amazing Birthday month for you! Thanks for being so generous! You are AWESOME!! P.S. This giveaway is sweet!! Happy birthday! This one is so fun! I would love to get a pattern for the apron since I LOVE IT!! You are very kind to "Give". 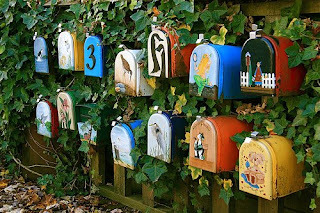 Hopefully you receive a lot too! Your month is almost over! I hope it as been a good one. I never win these things, but I still keep trying. congratulations to all, & be sure to email me at accordingtokelly@gmail.com so i can hook you up! thank you, thank you, thank you to everyone for participating this past month! it truly is better to give than receive! thanks for helping to usher me into a new decade. turning 30 has been so much fun! if this is any indication, then my 30's are going to be awesome! thanks for playing & helping me celebrate my birthday! for all you swappers out there... i hope you didn't forget to mail off your pretty little packages yesterday. that is, if you haven't already! i'm sure everyone is excited to see what their partners have chosen to send, & we wouldn't want them to have to wait too long! and finally, i just want to thank everyone for participating. i've absolutely LOVED playing the host. it has been so much fun getting to know everyone. i will definitely host another swap soon, so check back often!